Wizard's Hangout: National Scrapbooking Month - Dotty for You... You've got to see it!!! National Scrapbooking Month - Dotty for You... You've got to see it!!! To celebrate National Scrapbooking Month, from April 17th to May 31st, Close To My Heart is offering the Dotty for You Paper Packet. Over the next little while, I will be sharing different projects I've created with the Dotty for You papers. Isn't this a sweet layout? I ♥ it. It's one of the layouts featured on the "ideas" insert with the paper packet. I tweaked mine a little by using the embellishments I had. This is what the papers look like, and on the backsides of each of these patterned papers are solid colors with polka dots. 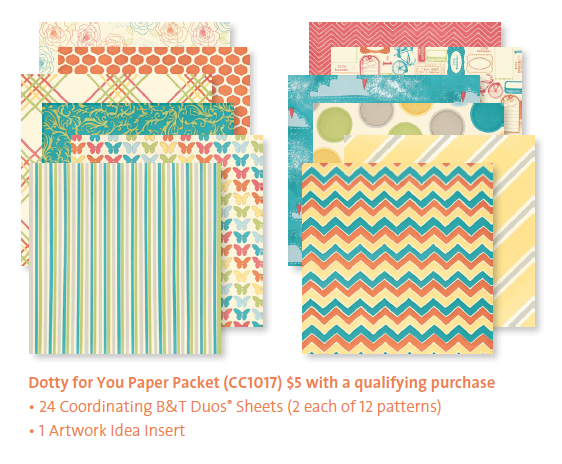 Place an order of $35 or more in products from the Spring/Summer 2012 Idea Book between April 17th and May 31st, and add the Dotty for You paper packet for just $5. Host a Gathering with a sales totoal of $400 or more (excluding tax, shipping/handling, and Operation Smile donations) between April 17th and May 31st, and receive a Dotty for You paper packet FREE. Join Close To My Heart as a new Consultant between April 1st and May 31st and receive a Dotty for You paper packet FREE. I'll be back tomorrow with another Dotty for You project. Love the new look of your blog--wider design space and more of that excellent Wizard's castle!